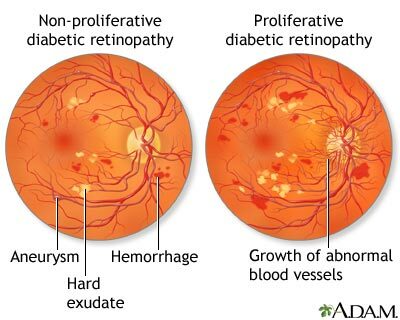 Diabetic retinopathy is an eye condition that affect the retina in some patients who have had diabetes for many years. The retina is the light-sensitive nerve tissue "wall paper like" that lines the back of the eye. Changes in the retina could cause significant visual impairment and even to total blindness. This is one of the leading cause of blindness in American adults. Severe Nonproliferative Retinopathy. Many more blood vessels are blocked, depriving several areas of the retina with their blood supply. These areas of the retina send signals to the body to grow abnormal and weak new blood vessels for nourishment. Proliferative Retinopathy. At this advanced stage, the signals sent by the retina to grow these new, abnormal and fragile blood vessels. These blood vessels do not cause symptoms or vision loss. However, if they leak blood, severe vision loss and even blindness can result. Do Diabetic Retinopathy have any symptoms? In the early stages of the disease, there is often No symptoms or pain. However, DO NOT wait for symptoms to occur. When you Do have symptoms, that is indicative of having retinal changes. What can I do to protect my vision? You could have a Comphrehensive Dilated Eye Exam annually. Prevention and early detection is key for maintaining your vision. Keep this in mind: Proliferative retinopathy and macular swelling can develop without symptoms. At this advanced stage, you are at high risk for vision loss. Your eye care professional can tell if you have macular edema or any stage of diabetic retinopathy.